Do you remember the film “Full Metal Jacket”? The first half is a grim portrayal of the boot camp training a bunch of raw recruits receive at the hands of a brutal drill sergeant before they are shipped out for Vietnam. Although it is a dramatic recreation it seems to reflect the nature of army training at the time, which was to break down the trainees both physically and psychologically and then rebuild them as required. And of course, the requirement was to follow orders without question and kill on command. But it turns out that it doesn’t work. At least, it works in the short term, and the recruits become soldiers who serve as the blunt instrument of governments’ foreign policy. Where it doesn’t work so well is when the soldiers come marching home again. In the United States, between 11% and 20% of the veterans of the Afghanistan and Iraq wars suffer from Post-Traumatic Stress Disorder and 30% of soldiers develop mental problems within three to four months of returning home. An estimated 20% of returning Iraq and Afghanistan veterans turn to heavy drinking or drugs once they return to the US and In 2010, an average of 22 veterans committed suicide every day. The group with the highest number of suicides was men ages 50 to 59. Physical – the ability to physically accomplish all aspects of a mission while remaining healthy and uninjured. Spiritual – adhering to beliefs, principles or values needed to persevere and prevail in accomplishing missions. Mental – the psychological fitness required to effectively cope with the mental stresses and challenges met in preparing for and carrying out missions. Social — Social fitness is the ability to engage in healthy social networks that promote overall well-being and help optimise performance. Emotional – Being self-accepting, self-aware and able to handle emotions constructively. Family – This involves supporting your children, spouse, partner or parents and maintaining the health and unity of the family. of, relating to, or characteristic of war, soldiers, or the military life [originating from the Latin word martialis which derives from Mars, the Roman god of war]. When you only train soldiers for war, they are useless for peace. Resilience is about training for the aftermath of war as well as the war itself. The Art of Peace begins with you. Work on yourself and your appointed task in the Art of Peace. Everyone has a spirit that can be refined, a body that can be trained in some manner, a suitable path to follow. This expresses concisely the concept of physical, mental, spiritual and social resilience. Let’s start with the social. By this I don’t mean the well-honoured tradition of heading for the pub after practice. 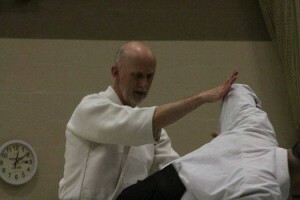 To me aikido is a social art; it’s hard to practise on your own. Certainly you can do weapons kata, and rehearse moves without a partner, but the essence of aikido is how we respond to someone holding our wrist, or punching at us. It’s about how we receive their energy, what we do with it. In the dojo we become frustrated, angry, joyful, bored, dispirited, and because we are in contact with our partners we share these feelings and emotions with them, and they with us, through a look or some tension in the body. And we learn to encourage each other and share in each other’s joy. Certainly aikido is physical conditioning. It starts with the warm-ups, which we can do half-heartedly, or commit to as part of the practice, and it continues into the lesson proper. I’ve never stopped to calculate how many times in a class we take a breakfall, but it could easily be over a hundred. And if that’s not body conditioning, I don’t know what is! As I’m fond of saying, “it’s not the being thrown that takes it out of you, it’s the getting back up again.” It’s like step aerobics, which burns fat and improves cardiovascular fitness, with the added difficulty of getting back to your feet from a prone position. Mentally, I think aikido is wonderful. What has kept me coming back to it for over thirty years is that I’m always coming across some new wrinkle, some new interpretation that someone has come up with. Just an inch one way or another and a technique won’t work, and your mind rolls that around going “Why is that?” Then a light bulb goes on, and illuminates something else you’ve been puzzling over, or it makes you realise something you thought you knew was right is completely wrong. I’ve got a shelf full of books on aikido, and I’ve only got to pick one out and read a page to have enough to mull over for a week. All life is a manifestation of the spirit, the manifestation of love. And the Art of Peace is the purest form of that principle.